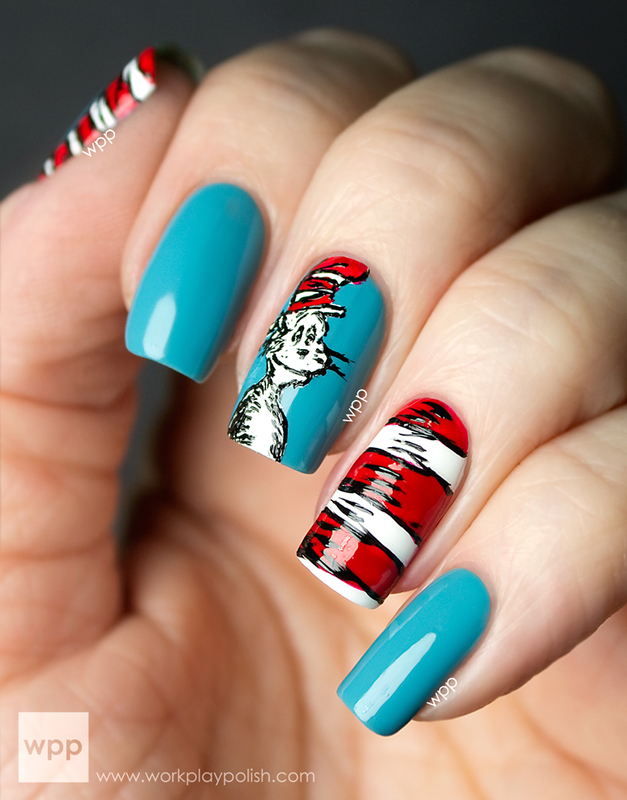 I'm excited to show you today's mani. First, you should know I'm a closet soccer fan. The small private school where I began my college career didn't have (American) football...only "soccer"...and so my fandom began - helped along by six months spent in Europe during my Sophomore year. 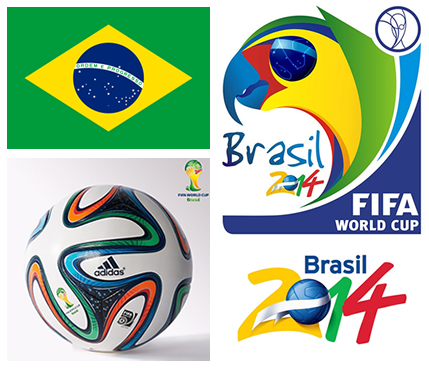 The World Cup is the most widely viewed sporting event in the world. Hosted in Brazil, the winningest team in World Cup history, the 2014 tournament kicks off in less than two weeks (June 12th)! And at the same time, Pure Ice will launch in Walmart Stores in Mexico and parts of Central America! I've talked about Pure Ice many times over the last two years. The polish line has a great range of shades and finishes in a nice formula - an excellent value for less than $2USD. Until now, Pure Ice has only been available in US and Canada (which means about 30% of my readers haven't had access to it). Fortunately that will change this June for readers in Mexico and Central America! I used six Pure Ice polishes: Superstar! 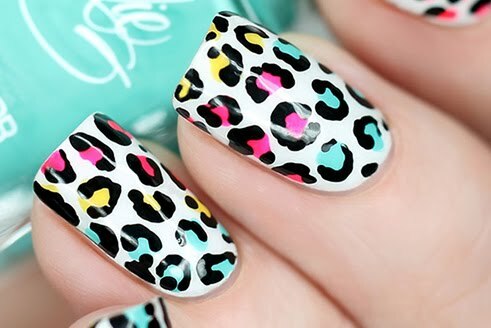 (white), Show Stopper (yellow), Free Spirit (green), Siren (red), French Kiss (blue) and Black Out (black). Unlike doing art with acrylic paint, nail polish is a little less exacting. I just kept going over the designs until they looked the way I wanted and had a nice depth of color. It looks more watercolor-ish than my last Lacquer Legion freehanded design, but I love it still. 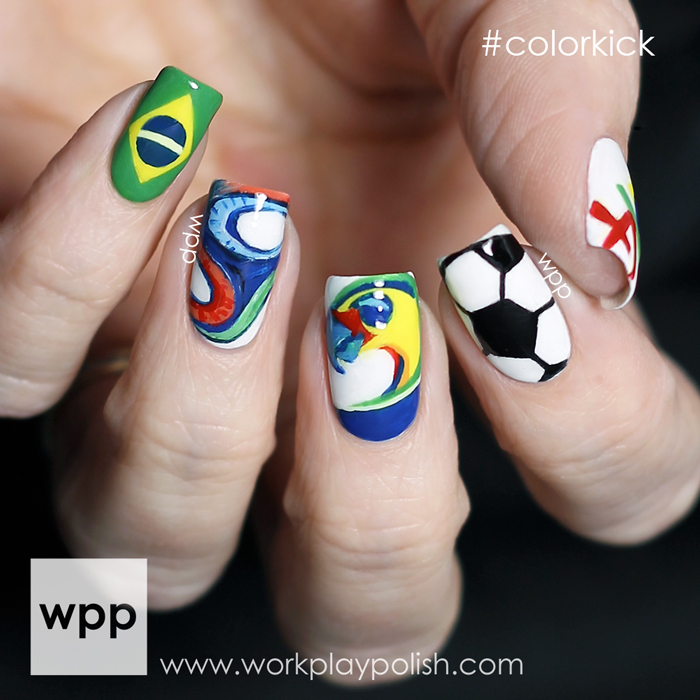 Are you a World Cup fan? 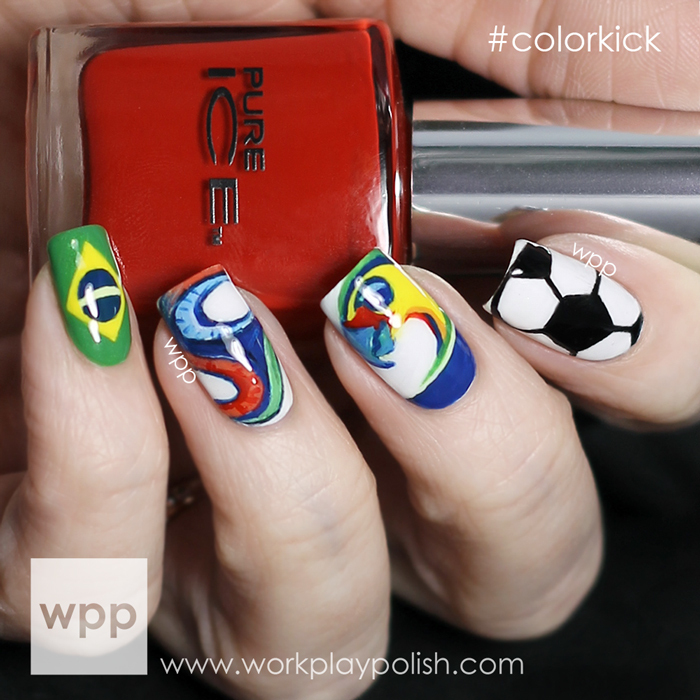 Join the fun by creating your own World Cup-inspired nail art and tag it with #colorkick. Pure Ice may just share your look (and I bet fellow soccer fans will too)! Pure Ice is available exclusively at Walmart in the US and Canada and will soon be available in Mexico and parts of Central America. To stay current on news and promotions, follow Pure Ice on Facebook, Twitter and Instagram.